In August 2010 Alec Finlay and I visited Lochaber as part of The Road North. 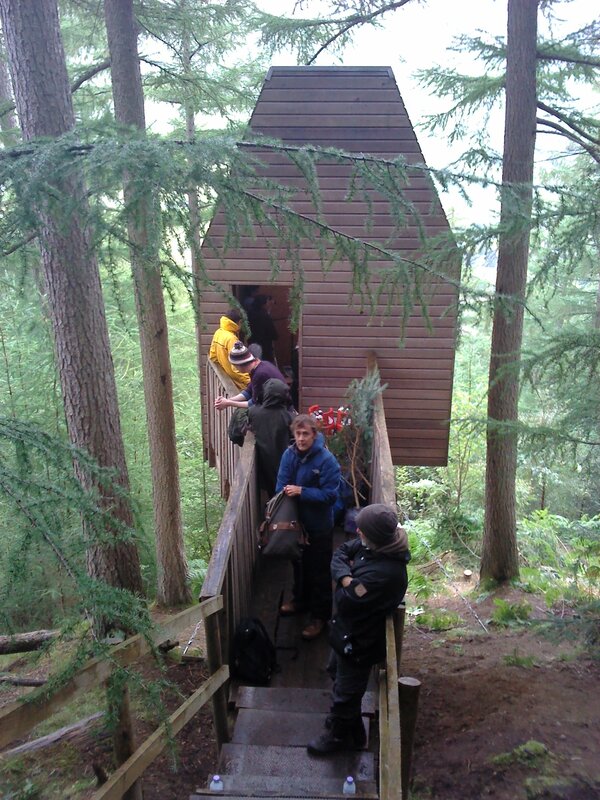 Our destination was Outlandia, a newly-built mountain hut, or artists’ field-station, commissioned by London Fieldworks (Bruce Gilchrist and Jo Joelson), designed by Malcolm Fraser, built by Norman Clark. Located a short, steep walk up from Fort William’s Braveheart car-park, it looks across the glen to the western slopes of Ben Nevis. You can read the account of our visit back then here. Four years on and we’re returning to take part in Remote Performances, a collaboration between London Fieldworks and Resonance104.4fm. Over the course of a week, a series of specially commissioned artist performances and programmes created with local residents were broadcast live from Outlandia. Driving north we stop and test the waters of Loch Eilt, a fondly remembered station from 2010, and we’re staying with Bruce and Jo, and many of the participating artists, at Frisealach in Lochailort, the house of Malcolm Fraser and Helen Lucas, where we also stayed a couple of nights in 2010. On the track up to Outlandia, Alec picks and I eat an angel’s-wing mushroom, prompting a Proustian memory of our previous visit; eating them raw in the hut with oatcakes, and cooked for breakfast at Annie Brigg’s the next morning, with fresh eggs from her chickens. Our contribution to Remote Performances is a reading of the long poem The Road North, which developed after and to some extent out of the blog we kept over the year we were travelling. In the hut we sit with our backs to the window at a table supporting a large sound-desk. There is no electricity supply to the hut, and Bruce tells me all the equipment is powered by a hydrogen generator, which runs off hydrogen drawn from the atmosphere. When I look up I see tree-tops and rain patterning the high roof-window. 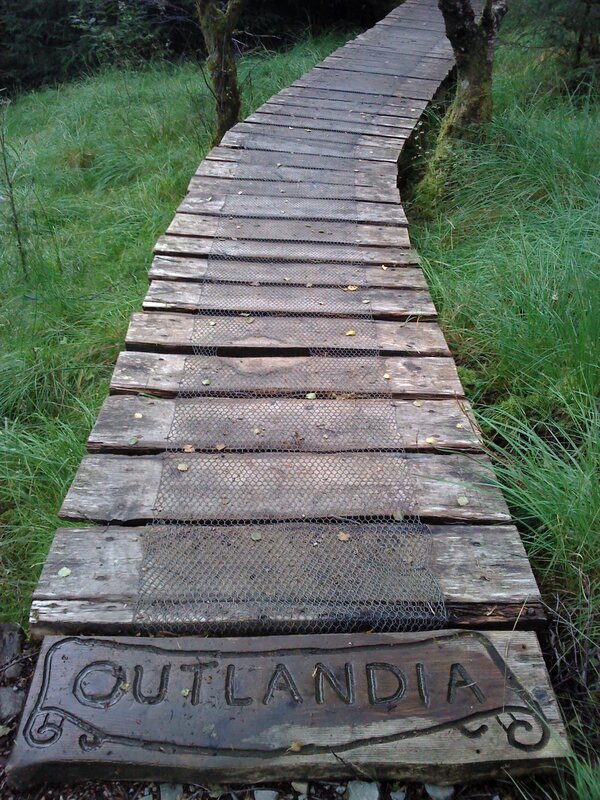 After a introduction from Tam Dean Burn, we’re on… back in Outlandia, recalling B-roads and Passing Places, and speaking to people… here, there and everywhere. We read the whole poem apart from the two Epilogues, which we don’t quite have time for. That reading is available on Sound Cloud, as are all the other Remote Performances broadcast from Outlandia; and the poem will be published in book form by Shearsman Books this autumn. With thanks to Bruce and Jo for the invitation to take part, and to everyone who made Remote Performances possible.